BEE launched its standards and labeling program in 2006 and since then many electrical appliances are being rated on their efficiency on a scale of 1-5. Most appliances are labeled and sold as BEE star rated appliances. Even after all these years, the level of efficiency of appliances in India has not reached the level of efficiency prevalent in most efficient appliances globally. A study by Prayas group of Pune suggests that if a rapid market transformation is done to only four appliances: room air conditioners, refrigerators, television sets, and ceiling fans: India has potential to save 60 million units of electricity (source). This translates to avoiding a peak capacity addition of 20,000 MW. In view of this BEE has launched a new program to support manufacturing of Super Efficient Appliances and the program has started with Fans. What are super efficient fans? A regular ceiling fan that does not include any efficient technology consumes 75-80 Watts of power. Since BEE introduced star rating for ceiling fans, we have started getting fans that are efficient to the point that they consume only 45-50 Watts of power. 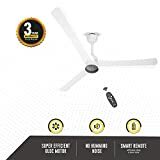 However some people had complaints with BEE 5 star rated fans about their air delivery being less (and some more, which we discussed in our previous post: BEE 5 Star rated ceiling fans: myths and realities). The regular fans have air delivery of about 250 cumm and BEE 5 star rated fans have air delivery of 210-225 cumm. Looking at all this BEE has proposed a Super Efficient Fan program where fans manufactured will consume only 30-35 Watts of power and would deliver about 230 cumm of air. In the previous post mentioned above, we have already written about our test results of a ceiling fan that delivers about 225 cumm of air and we hardly felt much difference as compared to regular fans. And thus we believe that 230 cumm is a good value. Looking at the high costs for buying a super efficient fan, most people would be interested in comparing numbers before making a buying decision. Below table compares all kinds of fans. Based on above numbers a BEE 5 star rated fan pays back for additional cost as compared to regular fan within one year. A Super efficient fan will pay back for itself in about three and half years as compared to a regular fan. 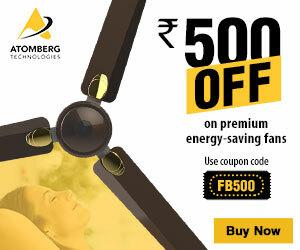 These numbers can vary depending on your use and cost of electricity, which you can validate, using our calculator: Online Electricity Bill Calculator – For all states in India. If your using cost is more than 5 then the payback can be faster. If it is less then it will be slower. What does Super Efficient Fan technology include? Performance is improved by improving the induction motor. Improving the design of the blades. The above implementations involve replacing some electrical components with electronic components thus allowing for a smoother control of the fans. Lowest power consumption reasonably possible. The one downside of a super efficient fan is that the power factor of such fans is 0.9 as compared to 0.95 of regular fans with induction motors. It may impact commercial connections with demand charges in their tariff plan.